You want to know about Play And Learn (PAL)? I wanted to know about PAL. So I decided to pay a visit. They converge at the Ajax Park at the University of Ghana, Legon. The first and only kid I interacted with was called Samuel. He was in JHS 2. I told him he looked older than he was and he only chipped me a striking smile that I remember to this date. A handsome young lad he was. At once, a part of my heart melted. For him and for all the other young boys on the football pitch. Who looked so enthused about everything they were doing. It was heart-warming to see all these kids having so much fun. They didn’t have to be on the streets selling or pick pocketing. They didn’t have to forcefully roll with peers who would drag them off to no good. They had found themselves somewhere where they were driven by passion. Driven by the love for the game and the will to succeed. They are no different than the rich kids in the classrooms nor the business man in the suit and tie. All of them are driven by the same urge to make it in life. Same world. Just a different community. It took one man to direct his hobby not just to help himself but to help others as well. Not just to gain satisfaction but to put smiles on the faces of kids who needed to see that there was hope in the world they lived in. Play and Learn began with three kids who every day came to watch the older guys play. Who were they to run unto the pitch and kick a ball and score a goal? So they sat at the sides of the pitch and watched on. If they were lucky, they’d get to throw the ball back to a player when it went out of line. One man in the name of Nana Kwasi Ohene decided to interact with the kids. Learnt their interest and also began helping them with their homework. 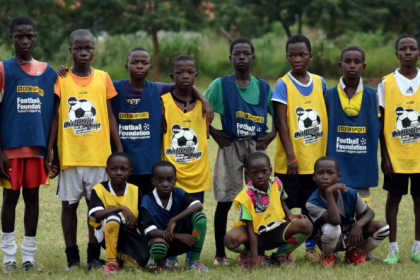 They played football and still concentrated on the academic side as well. Hence the name Play And Learn. It’s no surprise that kids will not let anything fun pass between them and their friends. Either to brag or to let them join in their fun. So they told a friend who told another friend, who told another. So that’s how right now PAL ended up with about 80 kids and counting. Let’s give it up for the kids. Just in Legon and its environs, look how many kids share in this common interest. That kept me wondering. What about the kids just outside the environs of Legon? What about the kids outside Accra? What about the kids outside the South? In the North. What about them? What about them? 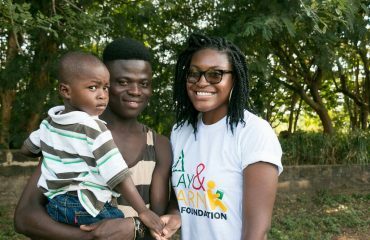 The Play & Learn Foundation works to empower Ghanaian youth through a combination of academics, athletics, mentorship, and community contribution to develop the skills needed to become leaders in their local and global communities.